My son´s Miele Sportrad is just about ready for a longer tour. Here it is in today´s brilliant autumn sunshine leaning to a big tree on the highest spot of our ride. It´s been a long haul to this point. As I already hinted at in an earlier post, my son and me are avid cyclists, sadly not so much engaged in real world cycling, but more in century riding. You cannot help but notice that there is a group of riders in our area who use Miele bikes exclusively on longer rides. They mostly hail from Gütersloh where Miele have their headquarters with a wonderful museum (on the net) and a large production facility. Why are they using those bikes? I´ll have to ask when I meet them, hopefully next Sunday for a training ride. 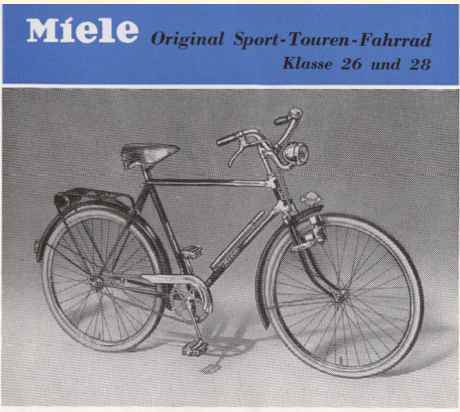 I for myself think that Miele bicycles were among the nicest built in Germany, very good quality, in a league with Dürkopp (who, contrary to Miele, also made racing bikes for all of their long history). And, of course, riding a bike with a washing machine brand name is something that is not easily replicated in any other field of transport. 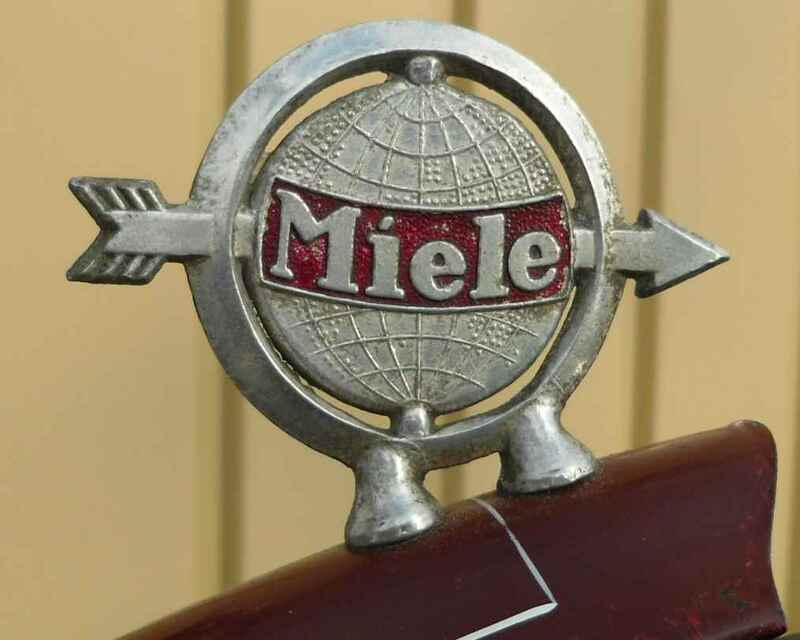 Miele made bikes between 1924 and 1960, and yes, it´s the household appliance people. They have a marvellous website depicting all their history (Miele-Technikgeschichte.de), and lots of free downloads of old leaflets and lists with years and frame numbers. This is a service I haven´t seen with any other (cycle) manufacturer, even extending to the offer of a free CD ROM with the bike catalogs and lists on. So is this my son´s bike, I wonder? Or this one, from a slightly more recent catalogue? My guess is it´s the older one in the top picture. 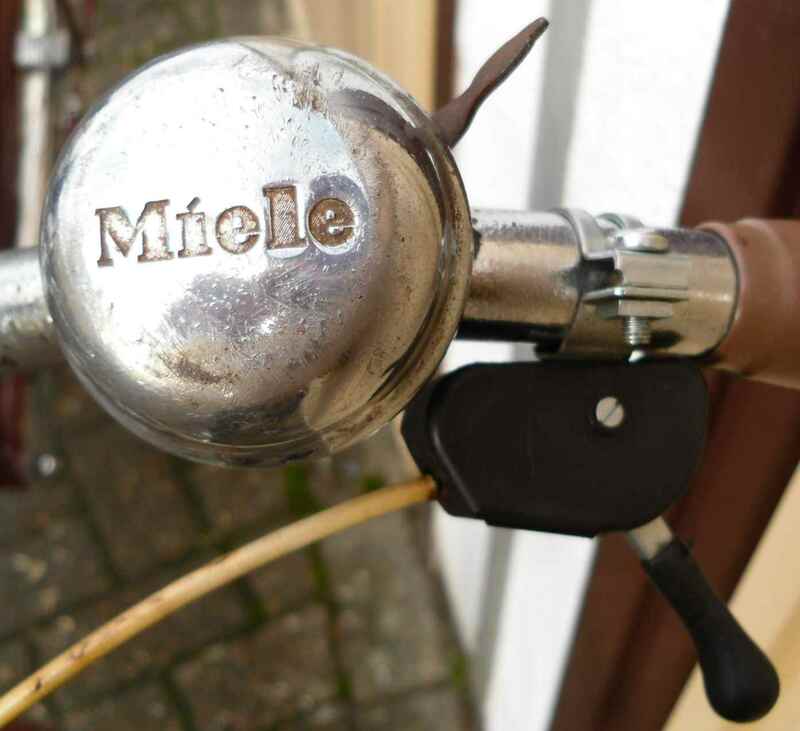 So my son and me thought we might like to ride with the Miele group, but getting hold of a good Miele bike isn´t easy half a century after production ceased. Sadly I had sold all my Miele bike stuff when moving house about 9 years ago, but then again, the Miele group only formed some years later. 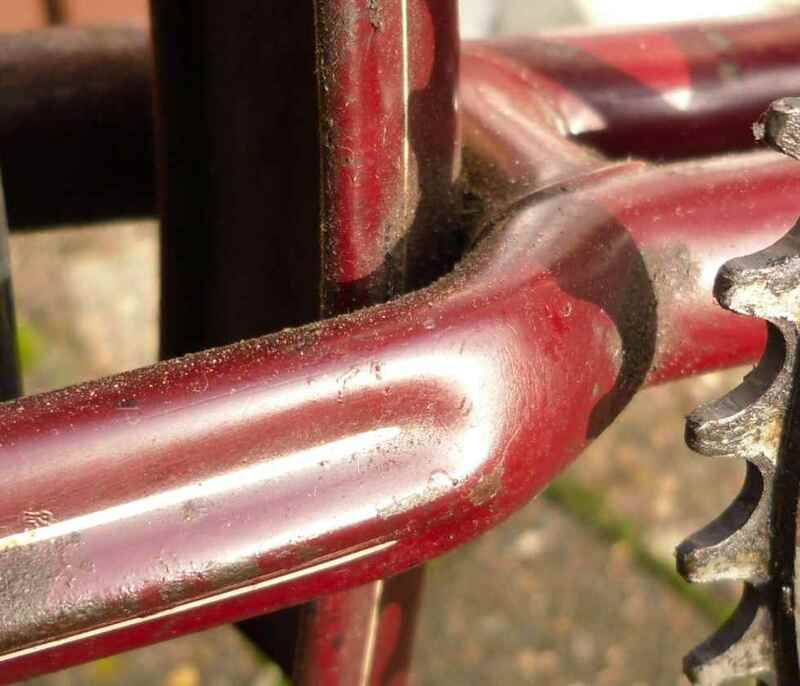 My interest was re-awakened when a friend sold me a very old (1930) touring frame (described in an earlier post) which I have since been desperately trying to build into something usable for century riding, but I´m beginning to think that it might not be a good idea after all. I´ve spent a good deal of money and dozens of hours on this bike, and I´ve ridden it for about 200km now and ironed out all but one bug, but riding a double century on it… I´ll have to see. Anyway, my son was lucky as he, too, was offered a Miele in a seemingly good condition. What do you need in an old bike you want to restore not to concourse, but to century condition, which I think is the more difficult of the two? The frame needs to be straight, it needs to fit more or less, and the rest will have to be relegated to a second place. So there it was, a 1952 Klasse 28 Sportrad, considered by many to be one of the most desirable Miele models, and in rather nice paintwork, too. Not time capsule condition, but OK. If you want to use a bike, it´s probably even better this way. Also it had 28 inch wheels, which I much prefer for touring over 26 x 1.75, which is smaller than 650B. The bike originally was available in both 26 and 28 inch wheel size versions. So I bought it and took it home only to discover that while it fits my son and the frame is indeed reasonably straight, nearly all the rest had to be worked on. The former owner had made lots of blunders, destroying the front hub bearing by overtightening, leaving out the plastic insert from under the coaster brake torque arm clamp so that it would move up and down, fitting a cheap Chinese side pull front brake which was a catastrophe, adding all sorts of modern equipment like 1980´s lighting or a clamp on kickstand which mostly went straight to the bin. 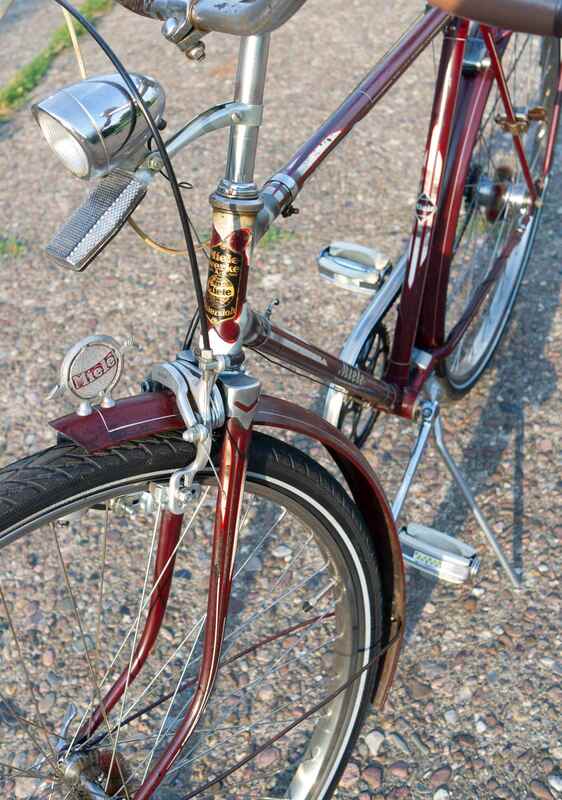 Courtesy Heinz Fingerhut/Velo-Classic who were most certainly not responsible for all the issues this bike had; they just helped me to get it. 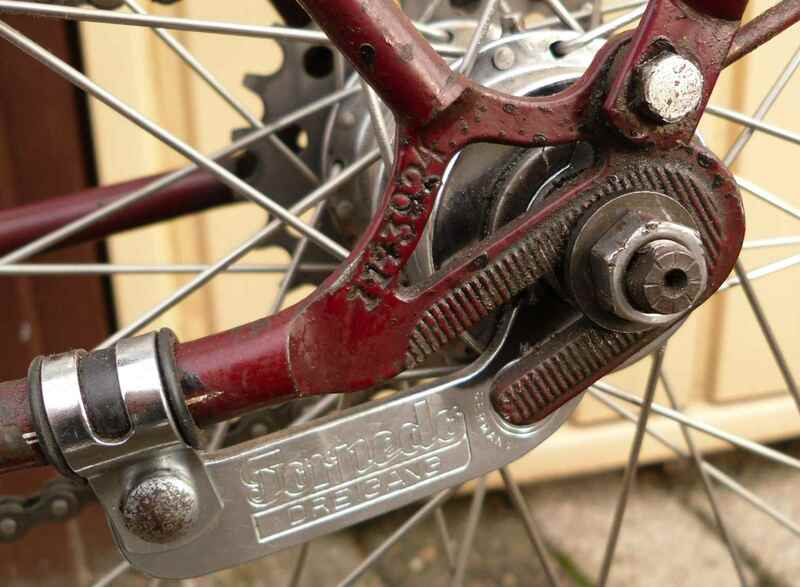 The rear hub had been fitted with the standard 19t sprocket, which must be meant for iron legged men, so we replaced that with a 24t one – much easier pedalling. The standard gear is third now (yes, I know about direct being the one with the least resistance), which gives my son two lower gears – nice in our hilly area. Something else I changed was the saddle; there is now a Brooks which doesn´t look completely out of place. 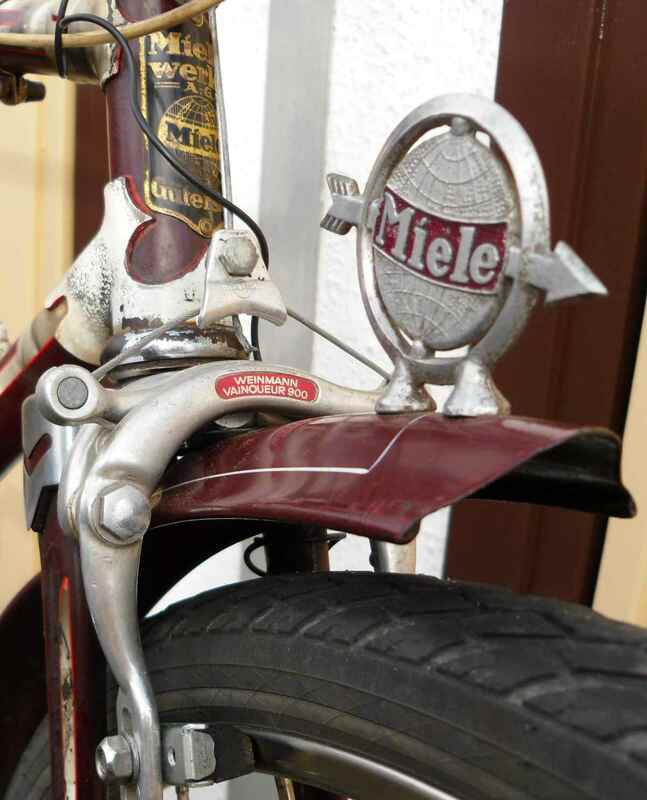 The saddle I bought the bike with wasn´t the original anyway; it should have said Miele on it but didn´t. I wrote an earlier post when the bike was all but finished, or so I thought, but then I got two bikes over the last ten days which had me spend more time on the red Sportrad. One bike was a complete goner with a 70cm tall frame, c/t, which I got for its Maguras and some other bits. I paid all of five Euros for it. At home I discovered that it had quite good tires of the size I required for the Miele, so on they went, and I had already recouped my fiver. 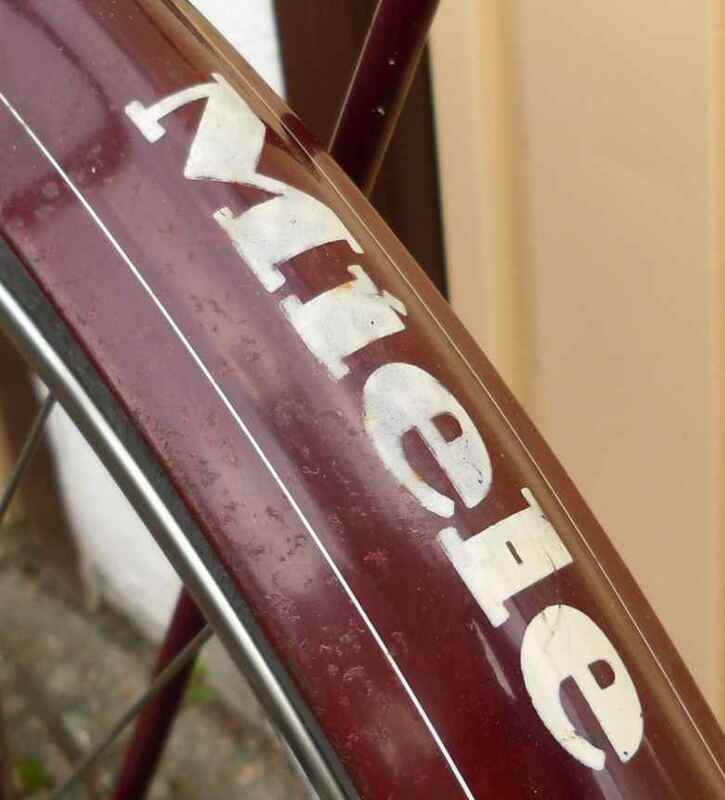 The tires I bought the Miele with were quite new, good quality, but too wide at a modern 28 x 1.75, as they kept touching the mudguard stays. The ones fitted now are 28 x 1 5/8, not the original size, but very rideable. The other bike I got was another Miele, but a lady´s one, from the same series than my son´s Sportrad. The lady´s bike had serious paintwork and originality issues, but it was quite exactly the negative of my son´s bike in that it rendered nearly all the parts still missing. We saw it on the internet, but only 20 minutes drive away, so we went straight ahead and bought it. The price was not too bad, especially considering the fact that it had all the bits we needed, plus a very nice 1950s Lohmann lighting set marked Miele which my son prefers not to lug around. So this is it now, my son´s 1952 Miele Sportrad in slightly modernized form. The regulation bell came off the lady´s bike as the one that came with my son´s bike had a bad mech: The former owner had replaced it with a non-working plastic one, sporting the bronze Miele bell cap, for whatever reason. I left on the black 1980s trigger for want of a red one. I really rather like this; I think it´s nicer than a Campag one. The serrations match with Fichtel und Sachs three speed washers which also have a serration on one side. 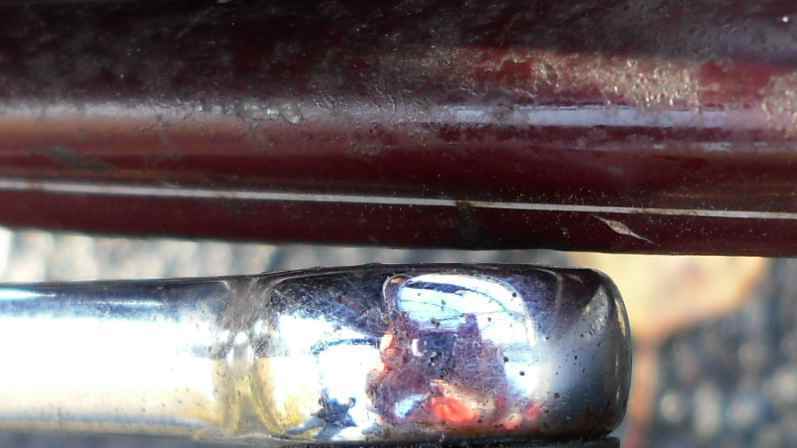 Tightening the axle nut means that there´s no slipping of the hub, whatever torque the rider might apply. 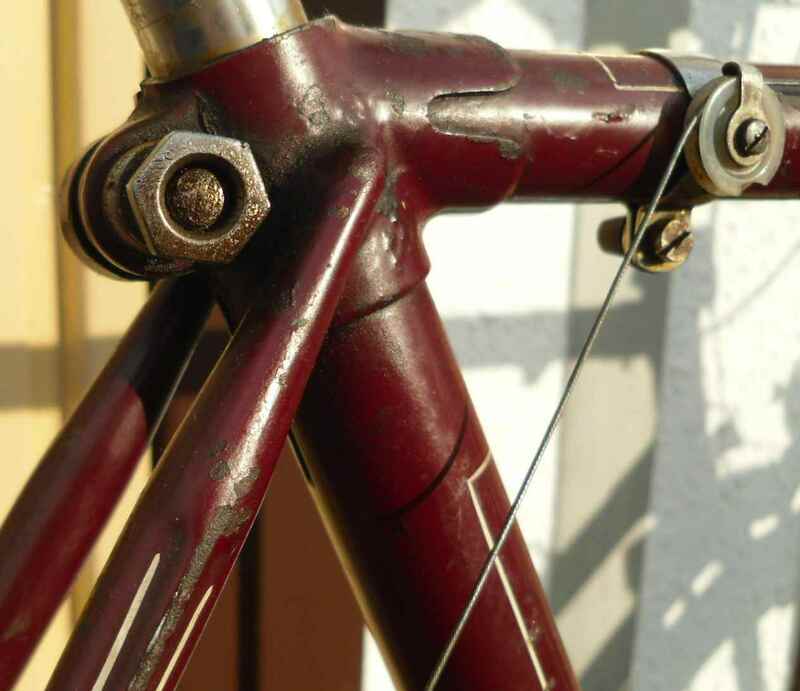 Yes, the stays are slightly bent, that´s the only structural shortcoming of the frame. I don´t think it is a serious issue, though. Someone must have blocked a hub at some time, I guess. The other side of the rear triangle is OK, though. 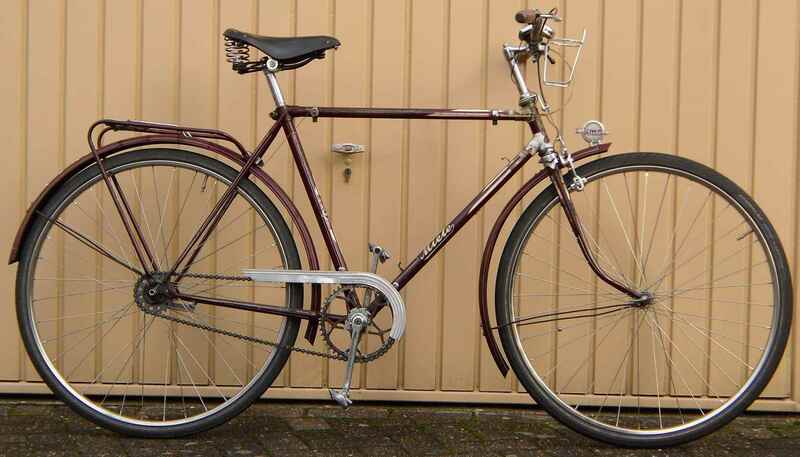 which I also kept as the wheels seem to be well built (excepting perhaps the lack of brass washers under the spoke heads) and the original Altenburger alloy rims are hard to come by – unless you find a lady´s bike you can break for spares. We now have the original rims in rather good nick, but I think for riding, the wheels in the bike now are the better option than the original ones. 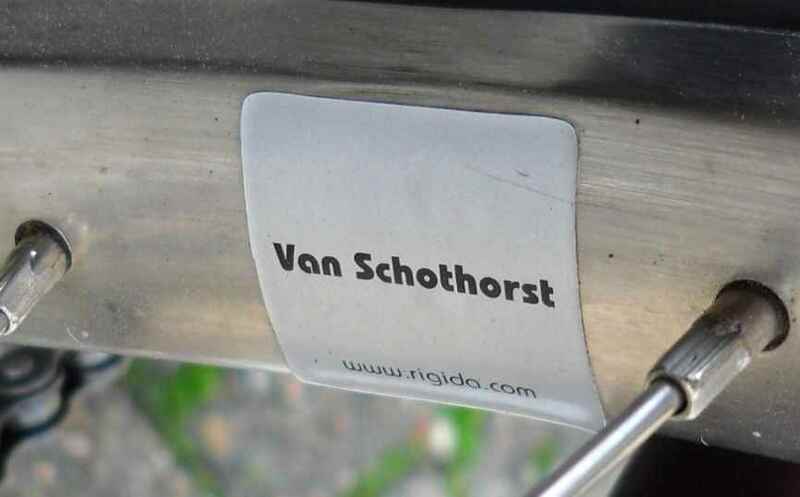 The van Schothorst rims pass the ten foot test anyway. 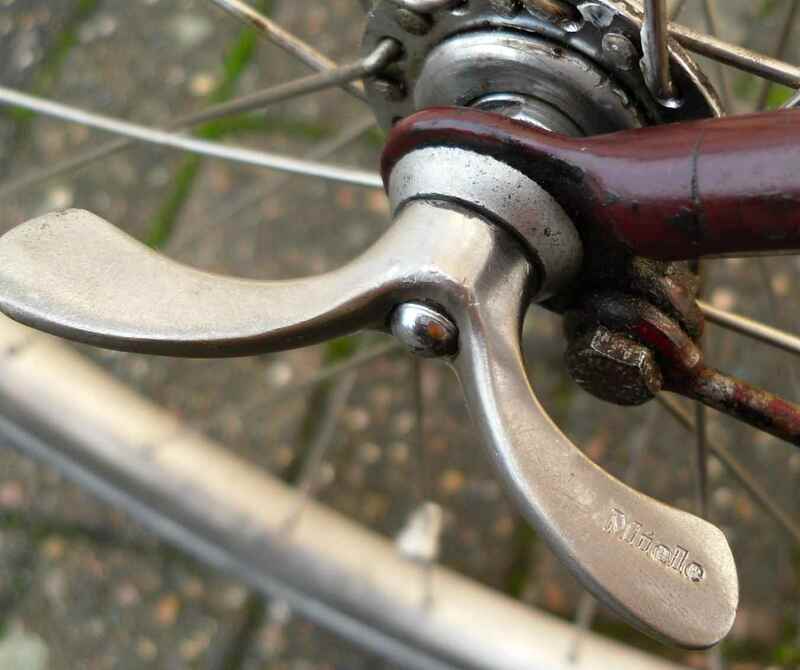 The original rear hub was a single speed Torpedo coaster with a three speed derailleur planted on it – very weird, because it means of course that there will be no rear wheel braking as the derailleur chain tensioning spring will take up most of the back pedalling action. 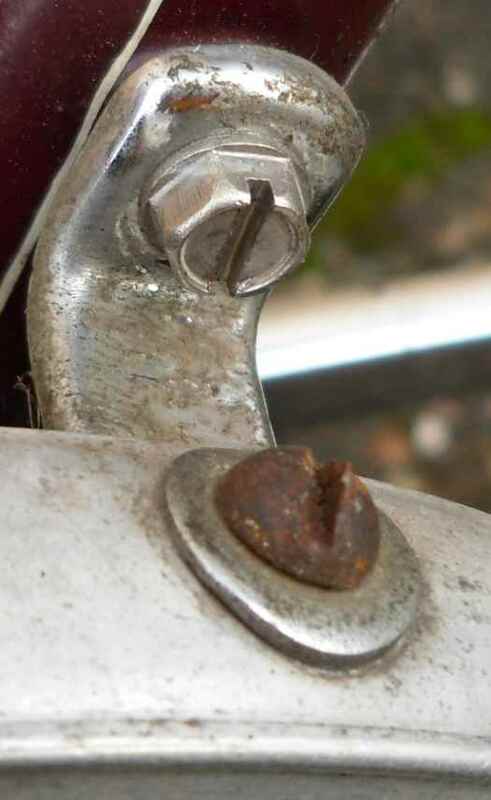 The give-away for this was the toggle chain guide used in this hopeless construction to be found on the seat cluster under the seat pin binder nut. The chain guide was still on the bike when I got it. The chainguard, here to be seen with the modern Shimano pedals, came off the lady´s bike, too. I bought my son´s bike with a horrible shoddy aftermarket chainguard. Not only is the chainguard fitted with the help of braze ons (a bit like bottlecage bosses), but it came off the lady´s bike easily and didn´t even have to be adjusted when transferred to the gent´s bike. Bolts reaching into the frame I replaced with stainless ones. And more proof of quality: Look out for the raised platform the oiler is on. Is this a cast b/b shell, I wonder? Or this: Q-factor seems to have been an issue in the day, too. Space between the crank and the chainstay is about two mil. 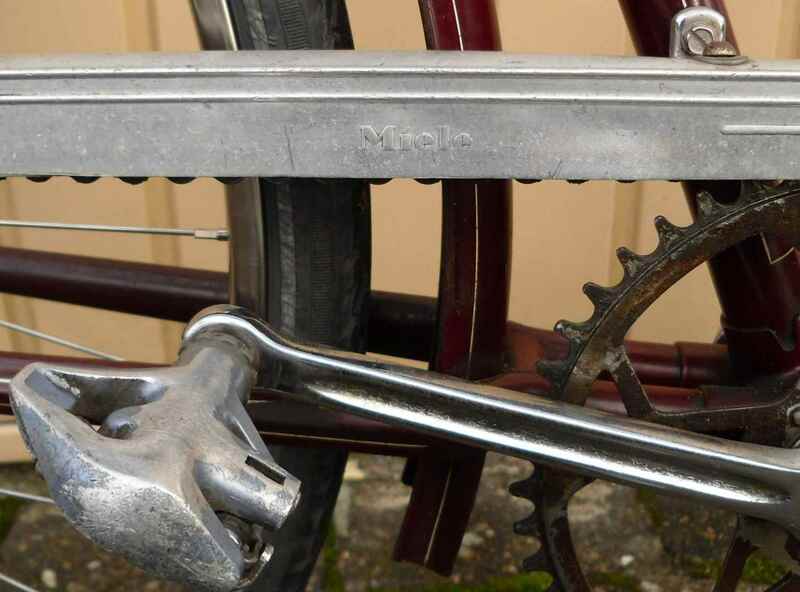 In later years, Miele would use Pletscher braze on parts to accomodate kickstands and more modern racks, and no doubt to make economies, too, but in 1952 they still used old school frame building designs. 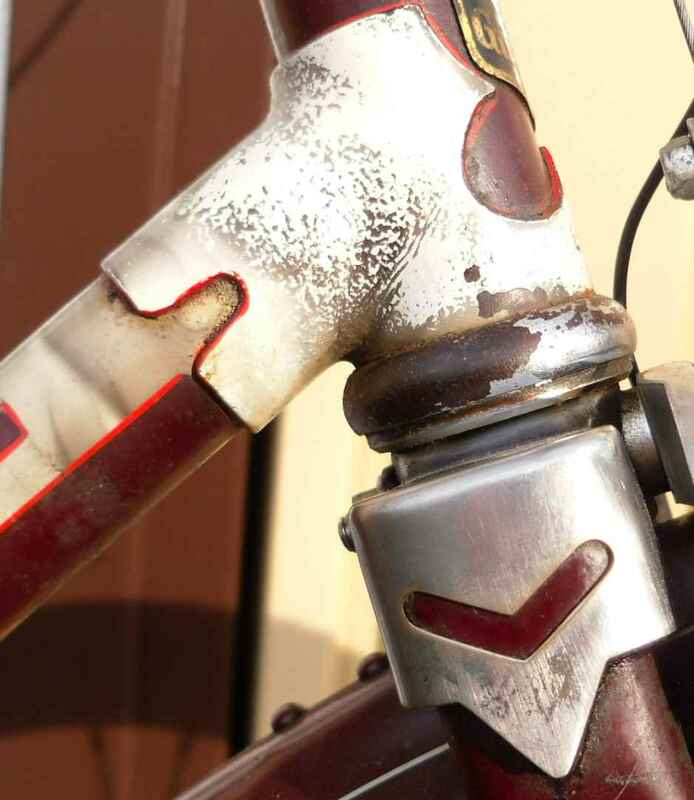 Someone had of course retrofitted a kickstand to this bike, too, damaging the paintwork of the stays between what you can see here and the b/b shell. 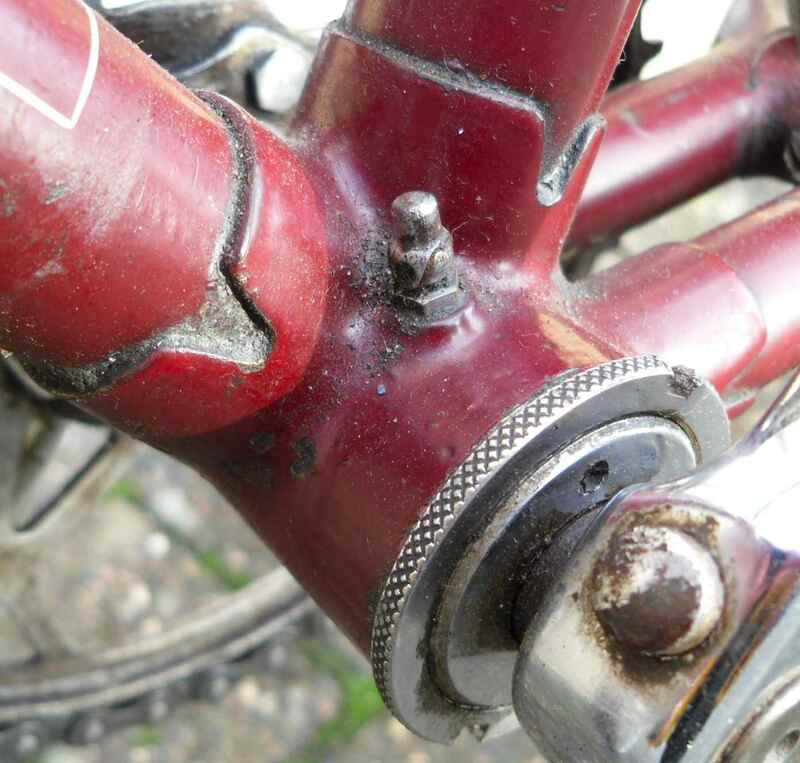 Luckily they hadn´t tightened the clamp too hard; I´ve seen bikes with stays squashed flat. This is what you need if you want to fit a German rack to a frame with a brake bridge and coaster hubs. 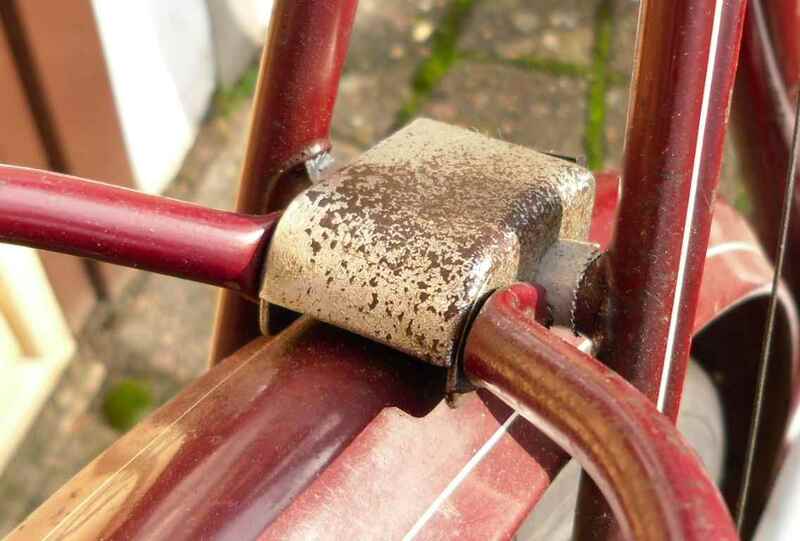 As there is no horizontal hole for a brake in the brake bridge, this ingenious little thing is fixed with the help of the mudguard bolt (vertical hole) and a rubber tube around the brake bridge. It clips onto the bridge and is set in place when the bolt is tightened. A nicer one came off the lady´s bike; forgot to fit it. I admit I´ve seen cleaner brazing (stay tops), and the seat lug could be more elaborate on its lower end, but no, it´s not a top quality racing frame, it´s just a good quality sports bike. I´ve also taken the liberty to screw plastic valve covers over the protruding bolt ends of the threespeed cable roller and stop clamps. Not sure if any mitering is required inside these lugs. I replaced the horrible Chinese sidepull with a Weinmann from the seventies – the sidepull was neither original nor effective. The original equipment would have been Altenburger sidepulls which aren´t too good either in the dimensions required, so I think this is the best option under the given circumstances. Also I still had the caliper in my Box. 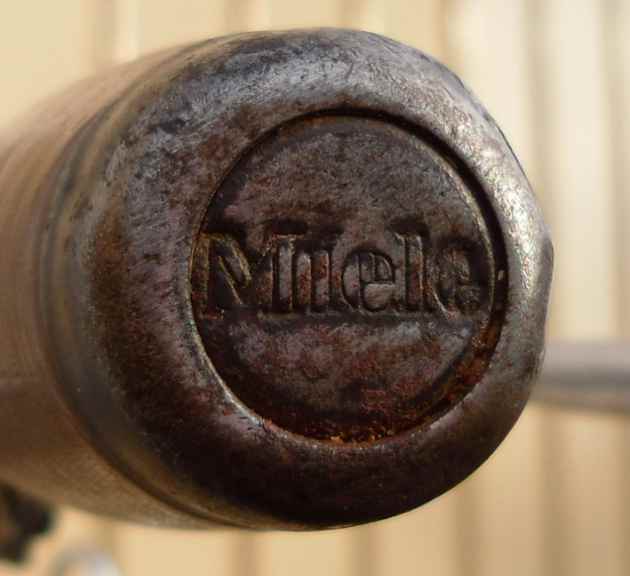 One last goodie: The Miele stamped front hub, with cones in special dimensions destroyed by a ham fisted previous owner, and replaced by – you guessed it – far better cones from the lady´s bike. Let´s see what comes next – can´t imagine next year´s riding will go without any wrenching at all, although it feels as if I´ve executed enough repairs on the Sportrad to last the rest of the bike´s lifetime. No, not blogging – something else. The genre of autobiography is considered by many literary critics to rank among fiction, and I agree. What better examples to prove this than the many cycle racers (auto)biographies. Here is a choice, quite eclectic and unsystematic, showing which tomes I was able to score over time. 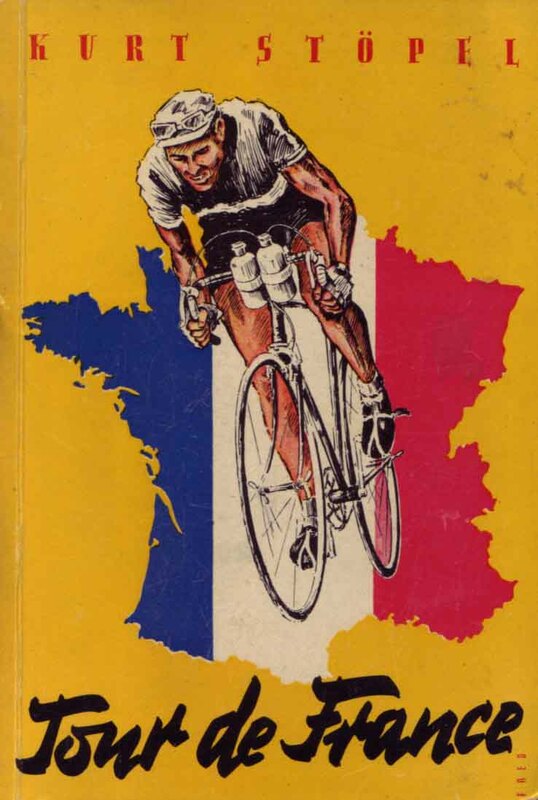 Most came from fleamarkets and, on two occasions, from the aftermaths of tidying up actions in cycling clubs´archives. I can remember well reading the first autobiography many years ago, it was Rudi Valenta´s Kampf um den Goldpokal, Wien 1956. I was impressed by the detailed description of many races and the wonderful photographs. Also I thought it was a great idea to have a framework story to start the book off. Lateron I found that of all the (auto)biographes I have read so far, five (Valenta, Simpson, Altig, Buysse and Kübler) work this way: The book starts with the description of a race which takes place when the rider is already famous, only for chapter two to depict this rider´s youth and first steps in cycleracing. There seems to be some formal leitmotiv here. 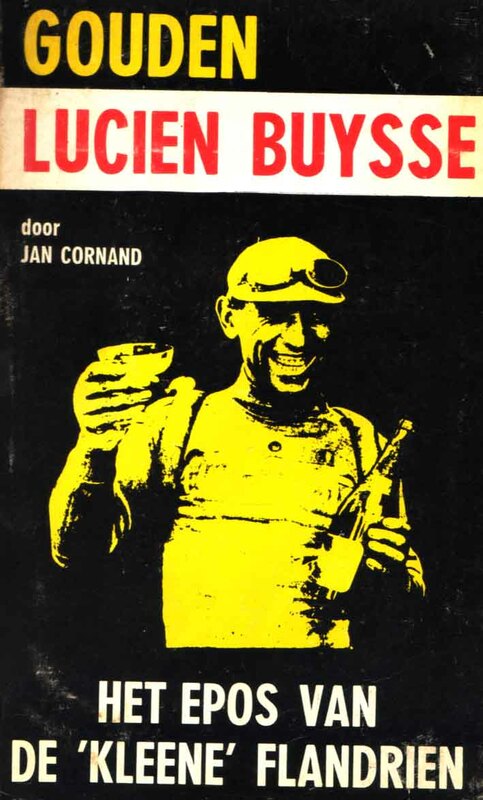 Buysse (Gouden Lucien Buysse, Gent 1976) takes it as far as it gets: His biography starts when he is an old man and then jumps to a time before he can even ride a decent bike. BTW, Buysse´s book is my all time favourite because of all the wonderful pictures. There´s literally dozens of them, and all in very nice b/w quality. It´s a shame I can´t scan any, but doing that would destroy the soft cover binding. Speaking of topoi, or leitmotives, one soon realizes that there is a number more. One is: No drugs, no dope. There always is the single black sheep rider who does take doping substances, but he is punished right away, not by the authorities, but by life itself. Cycleracing is depicted as clean fun, a tough man´s sport, a fight to the end, but with equal chances. This of course borders on the ridiculous; drugs and doping have been part and parcel of pro cycling since times immemorial and will probably never be stamped out. Autobiography is fiction, just like I said. 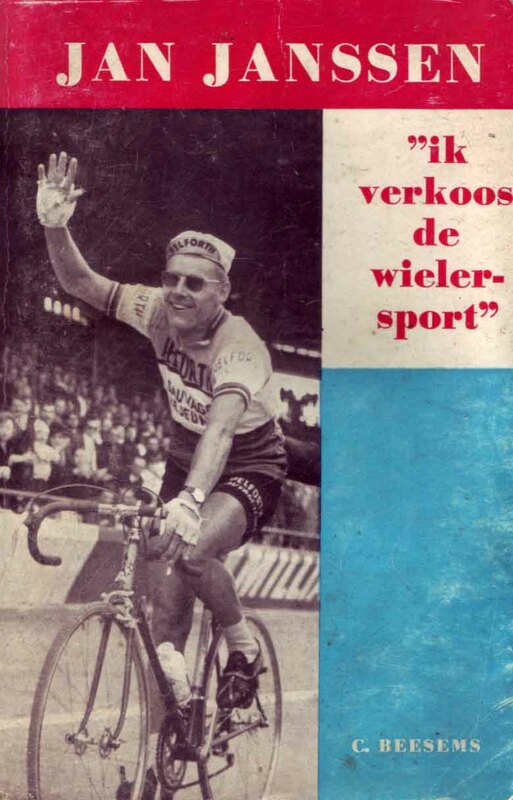 Next in line, all the riders have had a hard start in life, excepting Täve Schur (Unser Weltmeister, Berlin 1959) who became Eastern Germany´s cycling star, so him having been a working man´s son would have been de rigeur, but strangely there is hardly any mention of his background. Ferdi Kübler (Training-Kämpfe-große Siege, München 1961) relates that his very strict father saved every penny to open his own shop, so Ferdi and his siblings had to do without shoes (p.98). It is Swiss Hans Knecht (Strasse ohne Ende, Zürich, no year given) who really hails from a background that would have done honour to Täve Schur: Knecht´s father is a violent man, and Hans has to save money for a long time to be able to afford his first bike (pp. 48ff). He feels depressed because he thinks that his lowly background hampers him. Kurt Stöpel has to get up each morning at three to be able to fit training in his busy work schedule (p.3). Buysse´s parents run a small farm and can´t really let him go off cycleracing because they need his help. Janssen´s father is self employed and while not wealthy can get by. Nearly all future cycling pros had jobs early on in their lives which made them cycle a lot. 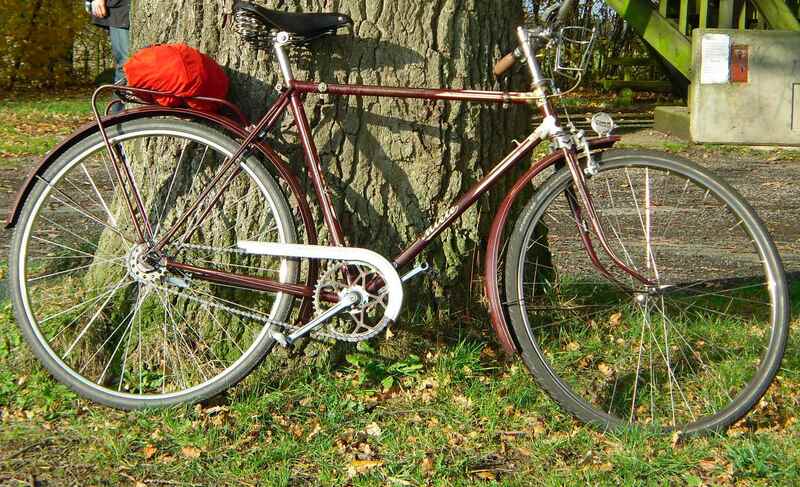 One rode a baker´s bike, Täve Schur cycled to school (p.15), Ferdi Kübler covered 84km each day commuting. Contrary to the doping and other items this sounds plausible. 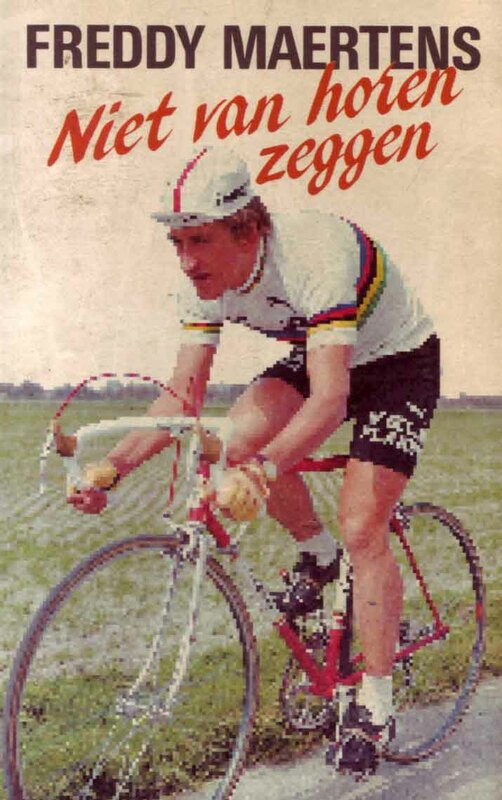 Freddy Maertens (Niet van horen zeggen, Antwerpen 1988) does a paper round before school (p. 17); Jan Janssen (Ik verkoos de wielersport, Rosendaal, no year given, ca. 1968) has to cycle 30 km each day to college (p. 12). Shall I carry on with the role of women in these books? I don´t think I could keep a straight face doing so. Women´s lib was a long way off, it seems. Most racers´ wives stayed at home with the kids while their husbands zoomed all over the world pursuing their manly trade. Style, BTW, often reflects this overly bourgeois way of life. 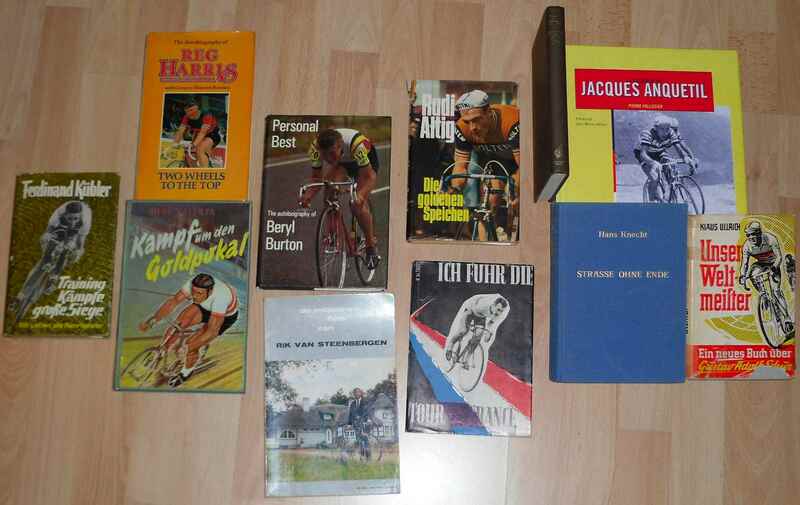 It seems sometimes it takes about as much stamina to read those books than to ride the races described therein.